We all want decent living conditions. However, for some families this might not be easy to achieve. Labor cost and materials are pricey. Many Filipino families share the same dilemma. On one hand, they need a decent home; on the other hand, food for the family and education for the children are more important. Children under VFV’s Sponsorship Program enjoy many privileges, including the opportunity to receive support for renovation or construction of their homes. It cannot be denied that some of our children live under less favorable conditions or they don’t have their own place. As such, we endeavor to find means to help the families of these children. This year, through the generosity of the students of Dulwich College in Korea, we have had the opportunity to build homes for two families of sponsored children. They donated 300,000 pesos, divided equally between the two families. Since each house costs 200,000 pesos, the additional fund needed to complete the houses was sourced externally from other donors. Neymark Morbos and Vincent Labrador qualified to receive the home construction support this year. Neymark with his father and niece. Neymark Morbos, 13 years old joined the Sponsorship Program in 2013. He lived in Brgy. Mohon, Tanauan, Leyte with his father and two younger brothers. His mother died a long time ago and two older sisters are already married. Their old house was built close to the highway, a danger zone, and the lot owned by the high school. Should the school need the lot, the family would have been evicted eventually. It was important that they transfer to a safer location. 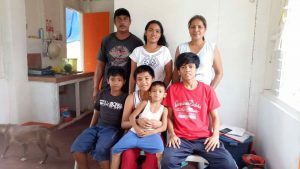 Neymark’s family was able to secure permit to build their new house in his brother in-law’s property in Brgy. Cangumbang, Palo, Leyte. Having secured the lot, VFV went on to build a new home for the Morbos family. Vincent, in red shirt, with his mother and sister’s family. while his mother was working as a domestic helper overseas for 10 years. In Tanauan, they only pay rent for the lot on which their house stood. For this reason the family qualified for the build-a-home project. Vincent’s mother was able to acquire a lot in Brgy. Tacuranga, Palo, Leyte from the money she saved working overseas. The new house for Vincent’s family was constructed in this location. Neymark’s and Vincent’s respective families moved in as soon as construction was finished. Both houses are bungalow but the foundations were built to specification to warrant an additional floor should the families decide to make an expansion. Confident in the knowledge that we were instrumental in providing a safe and secure home for these families, VFV would like to extend its heartfelt gratitude to all the donors who made these projects possible.